Randalls Riches is a video slot coming from Realistic. The game has a simple design with low level animations and decent symbol details. The game play in the slot is fast where the reels seem to spin too fast and the symbols just appear on the screen. For this slot the designers used a mining theme, so the action on the reels takes place in a mine deep inside the ground. But despite the simple design the game has a lot to offer in terms of payouts, thanks to the rich pay table. The Randalls Riches Logo symbol is the wild symbol in the game and he will substitute for all other symbols on the screen, except for the Scatter and the TNT symbol. 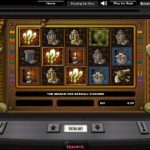 All of the regular game symbols in the slot can also land as gold symbols, in which case they will award a multiplier to the win which can range from x2 to x10 depending on the number of gold symbols. The scatter can land on all of the reels and once 3 or more land on the screen the Pick Axe Bonus is triggered. You will need to pick one of the scatters and it can award a cash prize of up to 1.000 x stake. If you land 3 or more TNT symbols on a pay line the Search for Randalls Riches Bonus is triggered. Here you need to pick Plungers and Weapons and blast your way into the cave. You can win up to 10.000 x line bet in this bonus round. Randalls Riches is an interesting video slot which has a simple design and bonus features. Still the slot comes with a rich pay table and several bonus features which can award some great payouts on the reels. 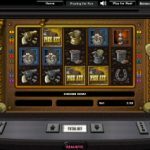 If you like simple slots you are sure to love Randalls Riches. 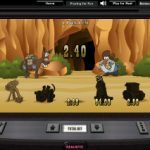 For another great engaging game you should consider playing Win Sprint a 5 reel slot by Realistic Games.